The app-based car service Uber has had a big year for business -- and controversy. Perhaps no single company has stirred so many emotions this year — across so many continents — as Uber. In 2014 Uber became more — much more — than a car service: The Silicon Valley startup became a symbol for capitalism itself. The company's value soared from under a billion to about $40 billion, making it one of the most valuable private companies on Earth. But it also has become mired in turf wars, legal battles and scandal. From San Francisco to Beijing, Jakarta and Ho Chi Minh City, Uber is in hypergrowth mode, expanding to more than 50 countries. And while it's hard to quantify, the backlash against the company has grown, too. Nevada became the first state in the U.S. to suspend Uber. In Europe, protests by cab drivers shut down the streets. India's Parliament was outraged after a woman allegedly was raped by her Uber driver. In Sydney, Australia, Uber jacked up prices during the recent hostage crisis. And in South Korea, there's a criminal indictment against Uber's CEO. Nancy Koehn, a professor at Harvard Business School, says Uber's business depends on freedom from regulation but that governments likely won't take long to catch up. "Because it's a window that's short-term in nature, they're moving very, very fast," she says. In fact, you could sum up Uber's strategy with that well-known saying: It is better to ask forgiveness than permission. Can David Get Too Big To Root For? That's nothing new in the history of capitalism, of course. To become a giant, Standard Oil had to break laws on competition. The early railroad companies exploited that gap between what technology enables, and what the laws say you can and cannot do. Koehn says Uber is trying to charge through that gap as well, in order to "break through" medallion requirements and state regulations about consumer and passenger safety. If history is any guide, Koehn says, Uber can't avoid regulation forever. Laws help companies be accountable, she says: "People loved the railroads until engines exploded and trains crashed because there was only single tracks." Uber CEO Travis Kalanick, who became a billionaire this year, has expressed worries about what will happen when Uber begins to be perceived as Goliath instead of David. "When people start to perceive you as the big guy, you're not allowed to be scrappy fierce," he said this year at a conference called TechCrunch Disrupt. "If you're the little guy ... that's cheered, that's lauded, that's the heroic sort of startup story." Another business professor agrees with Koehn that Uber's business depends on flouting the law. But New York University's Aswath Damodaran also says those regulations are unjust. "The Taxi and Limousine Commission might tell you about their background checks," he says. "I don't believe them, because when I get into a cab, I know my life is at risk." Damodaran says regulators are gatekeepers who are there not to bar bad actors, but to protect a taxicab monopoly, and that Uber is taking a stand. That stance clearly keeps the company's costs down, but it also is based on the principle of providing a valuable service to customers — who are also voters. "I think Uber's master plan is: 'If we have enough people who care about Uber service, and they vote, then we can get these regulations changed,' " he says. A company spokesperson said Uber is in favor of local oversight, particularly new regulations that make room for innovative options for consumers — which is to say, rules that give Uber space to operate. Sen. Al Franken of Minnesota, who recently dealt with Uber following a media-relations crisis, says the company displays signs that its practices haven't become more sophisticated as its revenues have rocketed up. Searching for the perfect adjective to describe Uber, he offers two more: "It may have been arrogant. But I think it was more clueless." This fall, a top executive suggested he wanted to use Uber data to dig dirt on reporters who criticize the company. In response, Franken — an Uber user himself — sent a congressional inquiry asking the company to spell out its privacy practices. The senator asked if Uber stores the date and time of every user's trip, for what purpose, for how long, and which employees have access to the so-called "God View" of a user account. He says that compared to other tech companies — like Apple and Samsung — Uber's letter back was disappointing. "I usually expect direct answers to those questions, and detailed answers to those questions." But NYU professor Damodaran says these kinds of challenges and beatings in the media are no coincidence, and are not because Uber drivers or executives are bad. He says it's because Uber has made enemies. "Trust me. There's going to be a crisis every month, pretty much, for Uber," he says. "Uber has to react in a mature way." In 2014, Uber became so much more than a car service. The startup became a for capitalism itself. The company's value soared from under a billion to about $40 billion. It's now one of the most valuable private companies on the planet. And it's also mired in turf wars, legal battles and scandal. 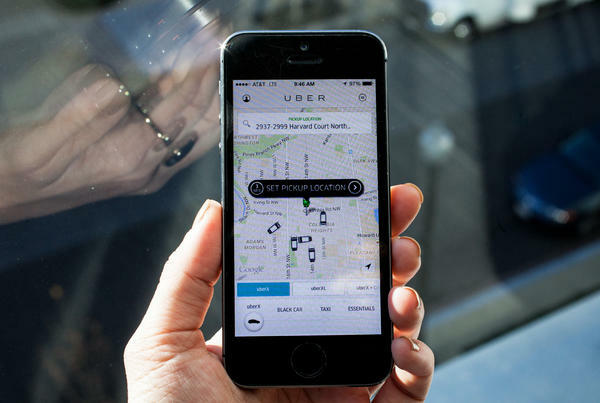 NPR's Aarti Shahani looks back on Uber's extraordinary year. AARTI SHAHANI, BYLINE: From San Francisco to Beijing, Jakarta and Ho Chi Minh City, Uber is in hyper-growth. It's expanded to more than 50 countries. And while it's hard to quantify, the backlash against the company has grown, too. Nevada became the first state in the U.S. to shut down Uber. In Europe, protests by cabdrivers. India's parliament outraged after a woman was allegedly raped by her Uber driver. In Sydney, Australia, Uber jacked up prices during the recent hostage crisis. And in South Korea, there's a criminal indictment against Uber's CEO. NANCY KOEHN: They have a window when they can try and make their money really, really quickly without all these regulatory, would argue in many cases, necessary, sweeping policing. SHAHANI: Nancy Koehn is a professor at Harvard Business School. KOEHN: And because it's a window that's short-term in nature, they're moving very, very fast. SHAHANI: You could sum up Uber's strategy with that well-known saying - it is better to ask forgiveness than permission. And it's nothing new in the history of capitalism. To become a giant, standard oil had to break laws on competition. KOEHN: Uber is trying to very, very quickly break through medallion state regulations about consumer and passenger safety. SHAHANI: If history is any guide, Koehn says, Uber can't flout the law forever. Laws help companies be accountable. Another business professor agrees that, yes, Uber's entire business depends on ignoring the law, but Aswath Damodaran at New York University says the laws are unjust. ASWATH DAMODARAN: The Taxi Limousine Commission might tell you about their background check and how much - I don't believe them. I don't believe them because when I get into a cab, I know my life is at risk. SHAHANI: He says regulators are gatekeepers there to protect the taxicab monopoly, and Uber is taking a stand, one that will pay off with customers who are also voters. And by the way, all the bad press Uber's been getting, Damodaran says it's no coincidence and it's not because Uber drivers are bad. It's because Uber has made enemies. DAMODARAN: Trust me, there's going to be a crisis every month pretty much for Uber. And Uber has to react in a mature way. SHAHANI: Senator Al Franken of Minnesota is searching for the right word to describe Uber's reaction to a crisis. FRANKEN: It may have been arrogant, but I think it was more clueless. SHAHANI: This fall, a top Uber executive allegedly said he wanted to use Uber data to dig dirt on reporters who criticized the company. In response, Franken sent a congressional inquiry, asking Uber to spell out its privacy practices. And to be crystal clear, Franken is not an Uber hater, he's a user because of his wife. FRANKEN: My wife sort of runs our, you know - how can I put it - our lives. SHAHANI: Franken visits his daughter. Other people visit their mistresses. The senator asked if Uber stores the date and time of every user's trip, for what purpose and which employees have access. And he says Uber's letter back was disappointing. FRANKEN: I usually expect direct answers to those questions and detailed answers to those questions. SHAHANI: The history of capitalism is littered with companies that fail because their leaders don't know how to pivot from David to Goliath. It's a real question now for Uber's CEO, a man named Travis Kalanick. TRAVIS KALANICK: When people start to perceive you as the big guy, you're not allowed to be scrappy fierce. SHAHANI: Kalanick is on stage a lot. Here at a conference called TechCrunch Disrupt, he gets uncharacteristically pensive. KALANICK: If you're the little guy, that's cheered, that's lauded. That's the heroic sort of startup story. SHAHANI: NPR reached out to his team to ask if his business depends on flouting regulations or if his stance on local laws will change as Uber enters newer cities. A company spokesperson responded - Uber is very supportive of new regulations that make room for innovative options for consumers - options like Uber. Aarti Shahani, NPR News, San Francisco. Transcript provided by NPR, Copyright NPR.